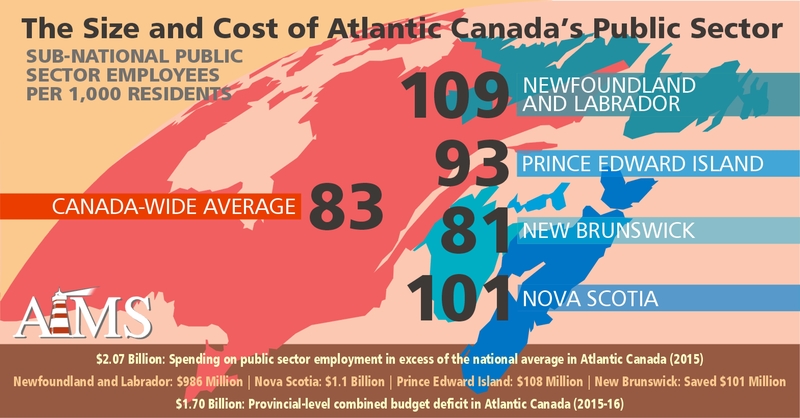 Public sector employment is a major cost for provincial governments in Atlantic Canada. The Size and Cost of the Public Sector in Atlantic Canada, 2015 examines provincial public sectors in Newfoundland and Labrador, Prince Edward Island, Nova Scotia, and New Brunswick. It finds that according to various metrics, the sub-national public employment of the Atlantic provinces is larger than their western counterparts. Our analysis uses Statistics Canada sources of population and labour statistics to discern the scale of Atlantic Canada’s provincial public employees. 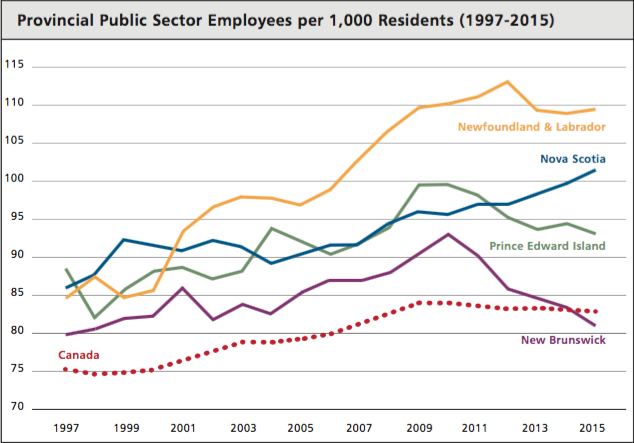 Three Atlantic Provinces employ a public service well above the national average in relation to population. The largest is Newfoundland and Labrador, at 109 public servants per 1,000 residents. Nova Scotia employs 101 per 1,000 and P.E.I. employs 93 per 1,000. 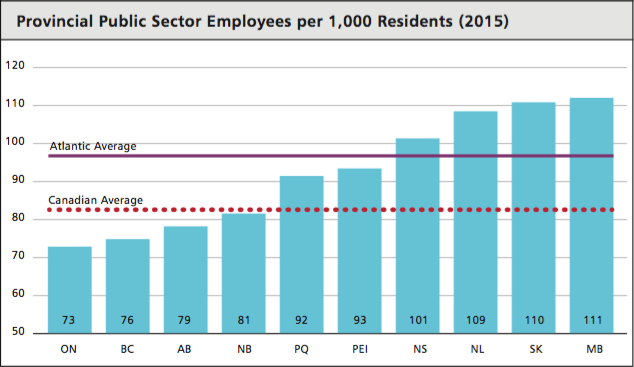 New Brunswick, meanwhile, employs fewer public servants per capita than the Canadian average and has achieved a reduction in the size of its public employment to just above 1997 levels. Provincially-employed public servants in Atlantic Canada are compensated at significantly higher levels than their private sector counterparts. Such an employee makes, on average, $68,600 per year. The average private sector employee in Atlantic Canada makes $46,500, or 47.5 per cent less. On Prince Edward Island, public servants make more than twice as much as private sector workers. Atlantic Provinces have four of the five highest percentages in Canada of public sector compensation as a share of overall compensation. Reducing the public sector wage bill would provide significant savings for government in Newfoundland and Labrador, Nova Scotia and Prince Edward Island. Had Newfoundland and Labrador employed the Canadian average number of provincial employees (83) at its own average public sector wage ($70,149) in 2015, it would have saved nearly a billion dollars and recovered enough money to close its budget deficit. Meanwhile, New Brunswick should be commended for reducing the size of its public labour force to below the national average, which in the last completed fiscal year saved the provincial government over $100 million.